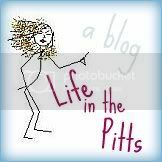 Life in the Pitts: Why my diet isn't working. Aw, man. Free food in the lunchroom is my downfall. I just can't say no. Dude, you're making me hungry and want to fall off my diet wagon, too...that looks too good! Me neither. Especially when the free food involves something sweet! Hang in there!!!! Who can say no to doughnuts? YUMMY!! 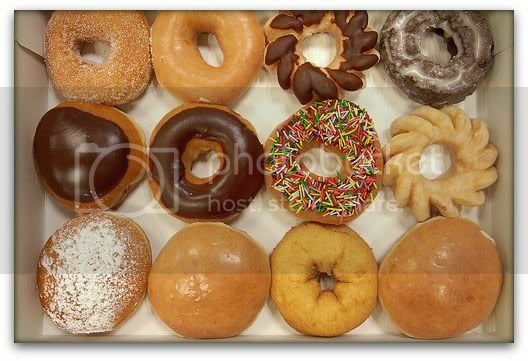 Thanks so much for stopping by my blog -- those donuts are such a tease!! 1. When you first started blogging, did you have any goals in mind for blogging, and have you achieved them thus far? 2. Per your "About Me" section, you say that you've married the man of your dreams. What makes him the man of your dreams, and what fun, snarky thing do you wish you could change about him? 3. Think back to when you were a child... What did you really want to be when you grew up? If you're not that now, what do you think changed, and looking back, would you still rather be this today? 4. Bucket List... If you've seen the movie, you know what it's about. If you haven't... well... you should (heh)... So what's 10 things that are on your "Bucket List"? So come on–let’s get to know each other better. And do not fear potential questions–I promise to play very nice. Good times! OMG! I want one of these sooooo bad. I to cannot have one. Aging bites. I use to be able to eat a dozen of them and never gain a pound. Welcome to the 40's I guess.